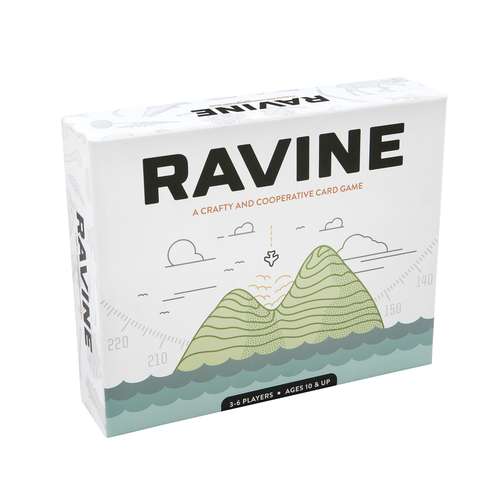 I played Kickstarter boardgame Ravine four times this weekend. Sitting at the table with my Minecraft-raised son and arts & crafts mum, we had a good time with its post-disaster collecting/crafting gameplay. One of us even got rescued (once). But when the game told me to sing, I stared blankly at the table top. I should explain. In Ravine, each player has a finite number of lives, shown by beautiful little wooden heart counters, and when you run low on these you go mad and have to draw and act on a madness card. After hundreds of hours playing Don't Starve, this is pretty familiar – sanity is a resource, and lacking it will hurt you – but when I pick up a card that tells me to shout the name of a fear until someone says my name I don't feel immersed, I feel impelled. I'm out of the crash site and back at mum’s table. Steve Jackson (I think!?) said once that “all games are role-playing games”. I land on free parking. I sink your battleship. The thing is though, I chose to join in. By taking away my consent, even in this small, lighthearted way, I'm not playing anymore. I'm a stooge. Like the GM who's out to kill the party, or the game of truth or dare that not everyone is comfortable (drunk?) enough to enjoy – you tell me what to do, and I dig in my heels. I want to be clear I had a good time with Ravine. It’s gorgeous and tactile, strategic enough for ‘serious’ game players, but light enough for everyone else. I think the resource management is too brutal, and I'm not going to be the performing seal it sometimes demands, but it's a fun game. It turns out though, that enforced hijinks, organised wackiness, don’t breed better play. Give me a space to play in, and I will make my own fun.